We Make Star Naming Easy! Do you love someone? Do you miss someone? Do you appreciate someone? Do they know that and do they know how much? Isn't it about time you let them know? Thank someone, encourage someone, recognize an accomplishment! We will work with you to produce a customized certificate as unique and special as those giving and receiving! Show Someone How Much You Care Today! Economy Star Package, Now $34.95! Name a star in the night sky after a loved one or special person in your life. 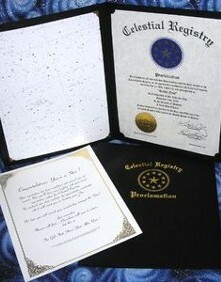 Celestial Registry is a customized gift for any occasion. Naming a star after a special someone is a beautiful tribute to one's memory. If you have someone in your life who is difficult to buy for, choose this truly unique gift...Leave a Celestial Impression! A Great Gift for a Special Person - From a Special Person. You can capture your thoughts, feelings and expressions to be printed on your unique certificate. Black Framed Star Package, Now $64.95! Do you have questions regarding Celestial Registry®? We have the answers you need. Visit our Q & A page where we respond to the most commonly asked questions. A truly imaginative gift for friends, family, coworkers, clients, awards, all occasions! Each Certificate Is Personalized With Your Own Expressions. We Will Print Your Own Words! Name a star in someone's name today. 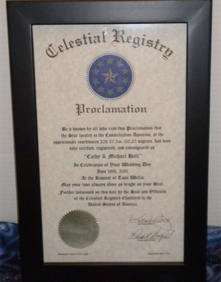 At Celestial Registry®, we want you to know a little about us. We take great pleasure in providing you with one of the most unique gift giving services in the universe and we'll always give you great personalized customer service. Are you looking for an unusual gift for someone special? Look no further. Now, you can name a star in the universe for anyone. Celestial Registry® of Haymarket, Virginia, will assign a name to an actual star and maintain the registration of the new name and the coordinates of your star. A named star is a great gift for any occasion, and best of all, you can customize the certificate with your words and special expressions of affection or appreciation. Gift packages start at just $34.95. 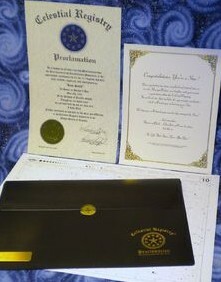 We will work with you to produce a customized certificate as unique and special as your intended recipient. Let us help you express yourself!